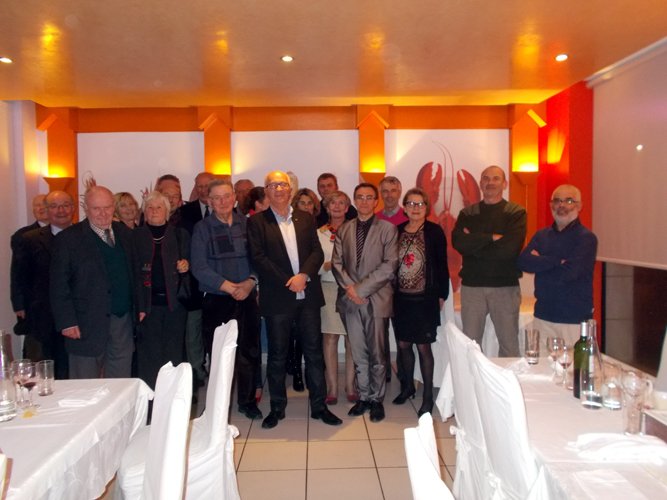 Tuesday, March 18, 2014, Lions club Lorient Armor hosted L’Expédition Scyllias at Le Neptune restaurant, in Lorient, avenue de La Perrière, to lead a panel discussion about the Lorient submerged heritage. L’Expédition Scyllias was represented by Vincent Alain Gautron and Jean-Louis Maurette who were facing to a small gathering of members of the notorious organization and could evoke contemporary wrecks, goals and projects of the association and share their passion for the maritime history through scuba diving. Lions clubs collect men and women animated by the same desire to serve and commit to taking action in the general interest in a spirit of humanism. Treatment of blindness is historically one of the leading causes defended by Lions. Lions Club in Lorient, chaired by Jean-Yves Cadiou, engages in many activities such as support to the association Rêves de clown (Clown dreams) or aid funding guide dogs. It participates in the financing of snow classes for a school in a disadvantaged neighborhood and Christmas gifts for underprivileged children, supports local initiatives, participates in regional and national actions as Téléthon, etc. During this conference, guests were able to discover with interest some remarkable and little-known subjects including Isère, Evangeline, La Bassure de Baas and other more popular as Tanche or Dévastation. Members of the Lions were able to immerse themselves dry to meet the original page and unknown history Lorient then discuss with stakeholders. Were present among the members of the Lions club Lorient a few personalities of boating and commercial fishing which resulted in friendly exchanges on both sides. A successful meeting which undoubtely, will appeal more ! The meeting of Lions Club with Jean-Louis and Alain Vincent.